Traditional roll shutters require a large 10″ – 12″ (250 mm – 300 mm) housing, ruining the style and look of your home. Now, with the Qompact shutter system, an 84″ (2,1 m) tall opening will require only a compact 6″ (150 mm) housing. That is 40 – 50% smaller, creating a much more appealing installation. 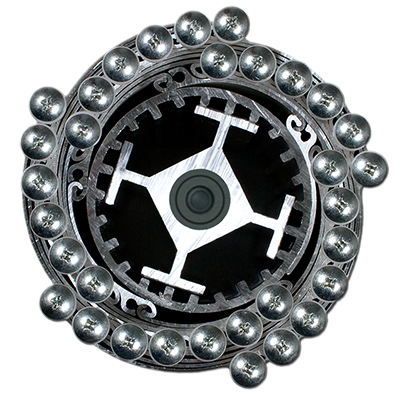 The Qompact® shutter system is available in manual and automatic operation. Using the patented nested design, the Qompact shutter system rolls smoothly and quietly 6/6 nylon bushings allow the shutter to glide smoothly through the security guides. Qompact combines premium design with unparalleled strength. The single-walled, extruded slats withstand sledge hammer impacts and hurricane impact tests. In head-to-head tests, Qompact outperformed its foram-filled competitors every time. Qompact’s end retention prohibits the curtain from being pushed out of the rails. Without end retention, the 40mm foamfilled curtain was easily compromised. End retention screws (shown below) keep the curtain captive in the rails. Qompact curtains can’t be pried out with crowbars or pushed out of the rails due to high winds. Note: Qompact can also be made without end retention where smaller siderails are suffient. The improved slat design is 27 times stronger than a perforated 40mm slip hinge, making a Qompact shutter impenetrable by comparison. 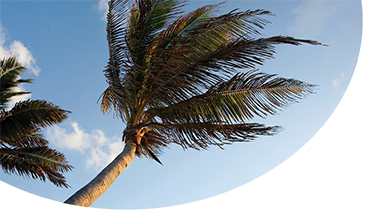 Qompact shutters meet the strict standards for U.S. Florida (FBC) hurricane approvals. In fact, Qompact passed with 330 km/h (200 mph) winds up to 6000mm (19.5 ft) wide. What makes the Qompact shutter system unique is the 10 different slat sizes that have been ingeniously engineered to allow the slats to nest tightly with each other. The nesting allows for virtually zero space between the slats, creating a compact roll and the smallest box housing required. Each slat grouping has a specific radius designed to accommodate the ever increasing roll diameter. This proprietary design means that each slat rolls together – perfectly. 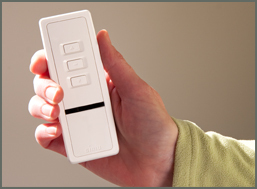 Home owners will love the quiet operation, elegant design, and security of the Qompact. 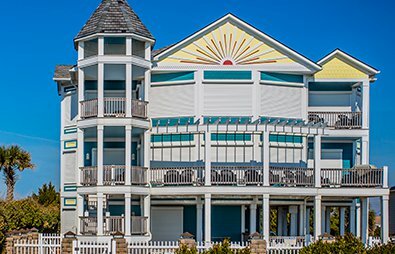 In addition to provacy and sun shading, Qompact uniquely provides security and hurricane protection. Qompact can be built both wider and taller than foam-filled shutters, making it the perfect choice for commercial applications. 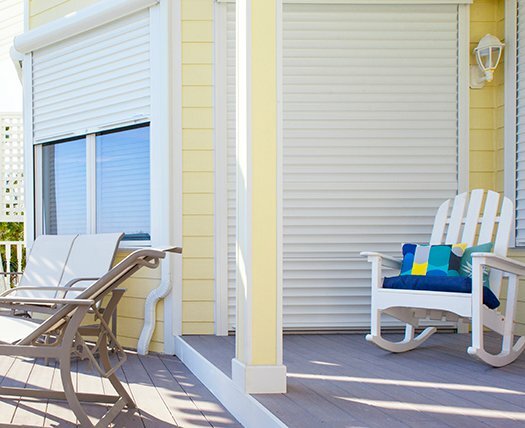 These shutters are widely used in the United States for their loss prevention and design benefits. 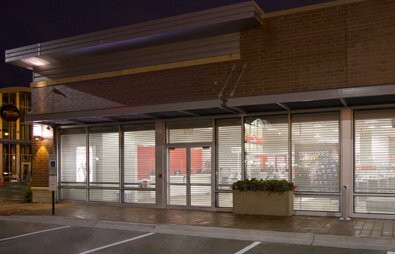 Commercial shutters can be perforated for night time merchandising. Qompact has a non-slip hinge, which allows for the use of a torsion spring inside the tube opposite the control mechanism. counterbalance resulting in the shutter locking in the down position. for larger shutters and requires less effort to rotate the hand crank. operation is available up to 13 sq meters without motors or gears. The torsion spring allows for smaller motors and extends motor life. a shutter curtain to free-fall. 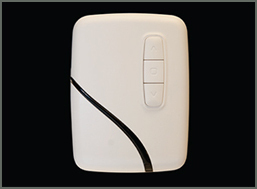 signal travels through the walls similar to a grage door opener. and/or by group with one control. Note: Size chart at left is for shutters up to 12’ (4M) wide. Shutters between 12’ and 20’ will have a small amount of tube deflection requiring a larger housing. Consult QMI engineering for exact size requirements for shutters exceeding 12’ in width. Slat type: Engineered roll-up with slat groupings increasing in size and radius to enable slats to nest around the drive tube to minimize housing size. Aluminum Single Wall Slats: Extruded aluminum, 6063-T5 alloy. Solid slats with non-slip hinge. End Retention: both ends of each slat to contain #10 x 3” truss head torx 410 stainless steel Dacromet-coated screws with shoulder bushings permanently engaged into a channel within the side rail to prevent the curtain from being pried or pushed out of a non-retained side rail. Qompact slats are not available in vision/perforated patterns. See AL7 security shutter for vision slat systems. Bottom Slat: Extruded aluminum, 6063-T6 alloy, 0.050 inch wall thickness. 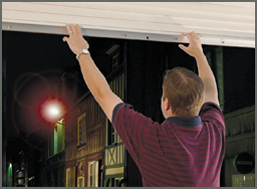 Motorized shutters do not require a lock since the motor maintains the shutter curtain in the down position. A separate locking base slat is not required. Gear operated shutters do not require a separate locking base slat. Provide non-latching base slat. EZ drive operated shutters do not require a separate locking base slat. Provide non-latching base slat. Motor options: see Level 7 Motors and Overrides and HZ and remotes. End Caps: Die-cast Aluminum (square) (45 degree) (round) profile. Color to match slats. Box Cover (hood): Roll formed aluminum; .036 inch thickness, 3105-H14 alloy. Two-piece assembly-profile to match end caps. Color to match slats. See level 6 Colors and Boxhousings for color and profile availability. Track Guides/Side Rails: Qompact, Aluminum extrusion, 6063-T5, lined with insulation woven polypropylene runners. Color to match slats. Aluminum extrusions; 6063-T6. Manual Rails: 4-1/4” x 1-1/8” retained and stop rail for manual crank or manual push up/pull down. 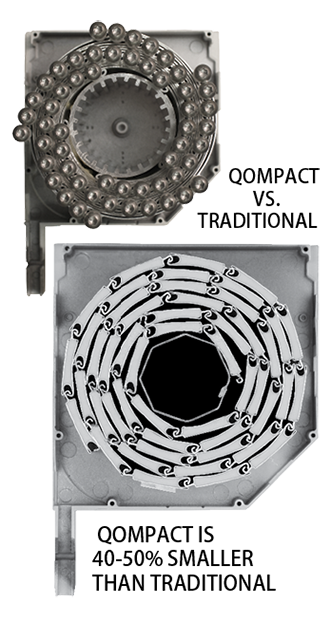 Drive Tube: Aluminum, 6063-T6 alloy – 70mm round with interior splines. 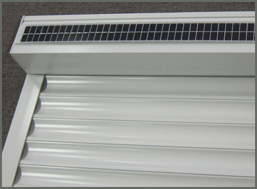 The coil size is significantly smaller than traditional rolling shutter curtain slats due to its unique roll characteristics. A reduced coil and box housing size gives customers more flexibility for soffit mounts. Smaller boxes offer less distraction from the home’s architecture. Competes with a steel shutter’s strength, but with the aesthetics of a smaller coil and the beauty of aluminum. 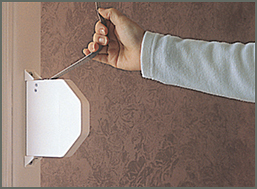 Up to 10 times stronger than a perforated slip hinge found in most double wall slat systems. 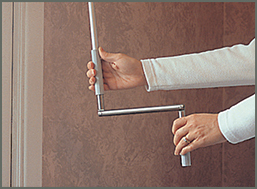 The unique roll characteristics provide the ability to install end retention screws to make the curtain captive in the rails. However, the curtain doesn’t require the end retention, and can utilize standard width rails in applications when the added security of the end retention feature is not required. Retained rails-every curtain slat has nearly 3,000 lbs (1361 kg) pull out strength due to two end retention screws. Shutter curtains can’t be pried out with crowbars or pushed out of the rails due to high winds. Qompact owners are very well protected from burglars and hurricane strength winds. The continuous contact design (non-slip) of the slat hinge enables the use of torsion springs for operation. 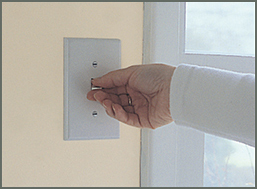 This simplifies the installation and provides for a very easy operating shutter. Smaller motors can be used when an assist spring is included. Torque motors can be used to operate very large shutters because the spring does the lifting. When other shutters need motors, the Qompact’s easy manual push up, pull down operation can be used for shutters up to 150 sq. ft.. Or for very large shutters, save on the cost of larger motors and extend the life of those smaller motors with the aide of a torsion spring opposite the motor for many years of worry-free operation. Up to 180 sq ft. (32 square meters) in total size. Up to 200+ inches (5M) high. Up to 20 ft (6M) wide. Larger maximum sizes gives you more flexibility. 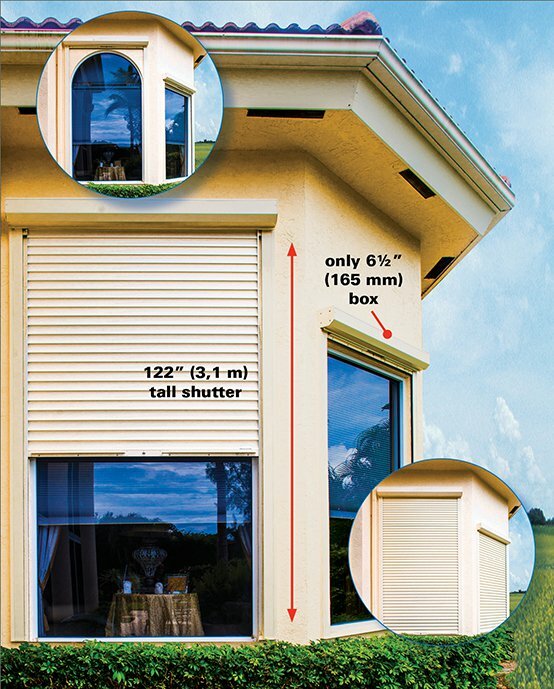 Protect a large opening with one shutter where other systems require two shutters and additional vertical supports obstructing your views. Due to Dacromet-coated stainless steel end retention screws with Delrin® bushings. No worries about rust stains with Qompact shutters. Even seacoast applications are safe to weather the outdoors for many years. Gear, low voltage, and motor drives with spring assists. Spring assist manual operation for up to 150 sq. ft. (16 square meters). Manual operation up to 160 sq. ft. (16 square meters) saves money over other shutter companies who must motorize and pay for electrical hookup. Spring-assisted gear drives make for smooth and easy operation. Our EZ drive system, a low voltage battery power, gives you more flexibility plus a simple motorized installation. To 15500 operations (42 years) and counting. Each shutter part has been enhanced for maximum durability and to reduce warranty service. Our Qompact customers will experience carefree operation for many years. Keeping the rails cleared of debris and operating them often will extend their life and provide maximum protection.